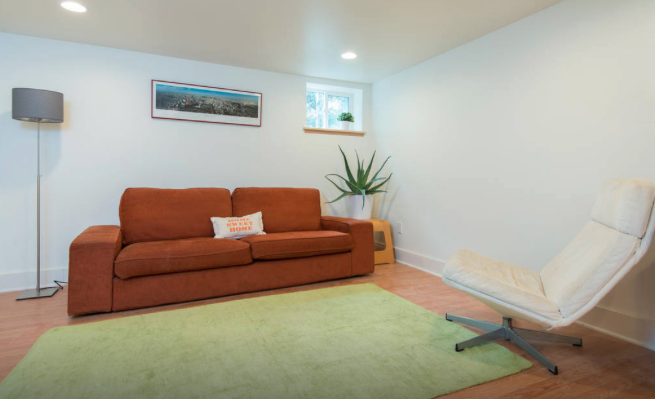 John Hayden was very familiar with ADUs before he began his basement-to-ADU conversion last summer because he had worked with a project management company in the Bay Area that specializes in ADUs. This investment would provide flexibility in terms of both their finances and their housing options. The recent birth of their first child also inspired Stephani and John to find a way to have friends and family close by. As they designed their ADU, John was inspired by the families he’d worked with and the multitude of reasons they’d created their ADUs. John explains that when a homeowner is remodeling rather than building from scratch, some of the design decisions are made for them, such as where the furnace and plumbing are located. The size and shape of the available space are also key considerations. John and Stephani kept their costs down by doing some of the work themselves and by calling on the expertise of friends who are plumbers, framers, and electricians. They appreciated the way friends rallied around the project and enjoyed the hands-on, community-oriented feel of their renovation project. Of course, not everyone has the skillset John and Stephani have, but they encourage homeowners to consider doing-it-themselves as much as they’re able. Interestingly, even with his background developing ADUs, John faced a couple challenges in the construction of his own ADU because basements often present special conditions – and sometimes special surprises. During their build, the two biggest challenges were electrical and fire walls. Stephani and John had to have the electrical main moved from one side of house to other because the mast wasn’t tall enough, so they ended up rewiring. He’s grateful that he found so much support from the city throughout the process of figuring out the details of the basement-to-ADU conversion. When describing the sustainability features of his ADU, John noted that converting existing space to an ADU is sustainable in and of itself because conversions take advantage of existing structures to create additional livable space. John also points out that the earth surrounding the unit moderates basement temperatures. They installed new Cadet style heaters, mounted higher up on the wall. Stephani and John are pleased with the heat system in the ADU, but it wasn’t what they’d originally planned. They had planned on sharing their furnace with the ADU but learned that in Portland an ADU needs its own heat source. The cadets were a relatively inexpensive and simple way to provide a separate heat system. John also points out that they help with sound since there aren’t any ducts carrying sound from one floor to the next. Stephani and John are using their new property as they anticipated they would: they live in the primary dwelling and friends, family, and short-term renters stay in the basement ADU. John says that when family members or friends stay, they open the door that separates the ADU from the house to make it easier to interact. 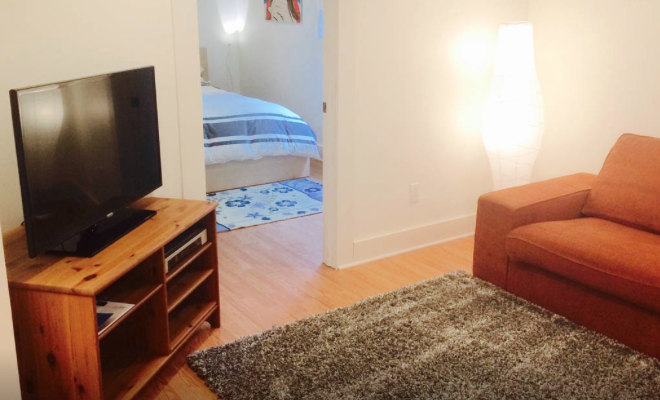 When renters stay, Stephanie and John become short-term property managers, sharing information about must-see sites in Portland. 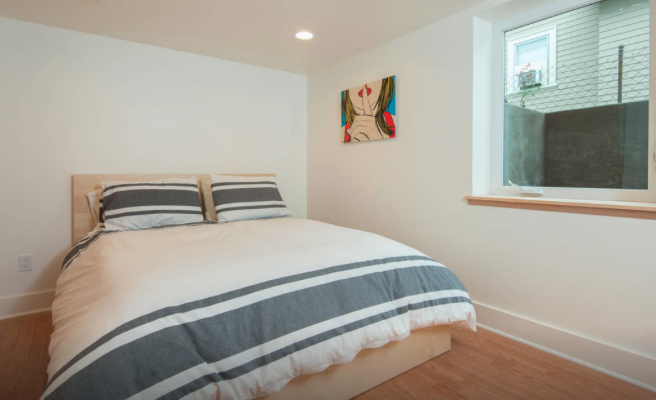 John says that he always felt the ADU project was moving in a good direction, but the biggest highlight was having their first short term renter tell them how much they loved the space. The ADU is currently serving Stephani and John’s needs very well and they anticipate that it will continue to do so in the future. When pressed, John says at this point there isn’t anything that he and Stephani dislike about having an ADU. However, he points out that they’re still in the honeymoon phase. He also notes that it’s an added level of responsibility, since there’s always something to think about. Whether they are doing an additional improvement or just preparing for the next renter, it’s another thing to be mindful of and responsible for. 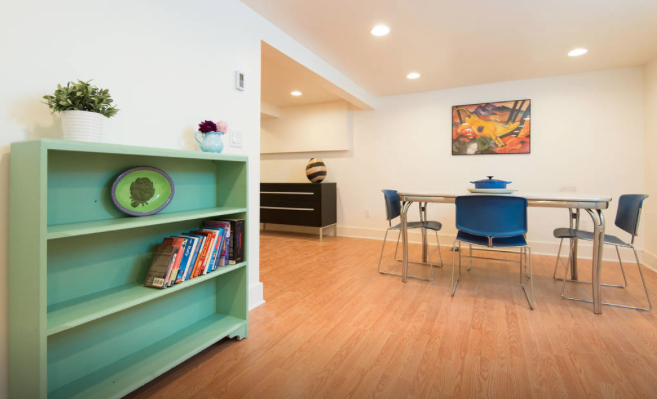 John says that’s not a negative thing, since he and Stephani have time to take care of these responsibilities, but it is additional work, especially for home-owners who decide to rent their ADUs out as short-term rentals. 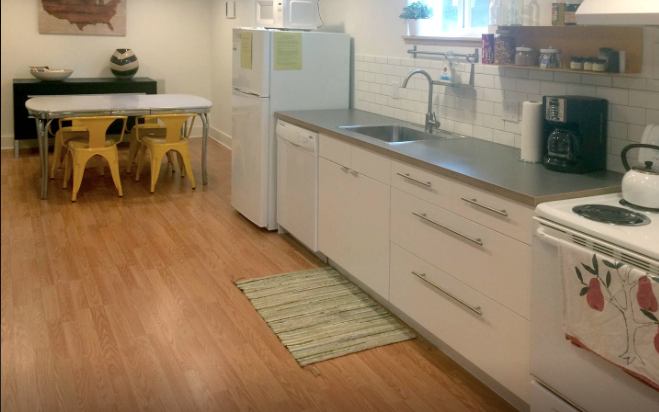 Of course, many units designed as short-term rentals have storage space like a hotel room – enough room to tuck away a week’s worth of clothes and a toothbrush, but nothing else. John and Stephani didn’t take this tack when designing their ADU. John says what he wasn’t expecting is the level of interest that other people have about it. It seems to him that ADUs have reached a tipping point in terms of awareness. 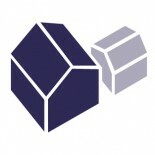 John has created a website called Golden Basement to help other people learn about basement conversions. So what advice does John have for someone considering creating an ADU? It’s great to hear about a more economical project. I’m surprised more people don’t go for basement conversions, especially if the goal is rental income. Rents for attached ADUs (such as basements) are nearly as high as detached, but construction costs are typically much lower. However, there is the privacy issue. Wood floors and joists above really tend to transmit sound. In particular I am wondering if John did anything special for the purpose of soundproofing? Thanks! Hi Martin, you’re right about sound. We studied this quite thoroughly and opted to use resilient channels to drop the ceiling drywall slightly below the rafters to minimize vibration and then also filled the space in the rafters with thick insulation. The outcome has been great and there are even more methods available if you want further sound controls. Hey Martin, question about sound in the ceiling. With our basement ADU the city of Portland was very specific and wanting sound batting, resilient channels and two layers of 5/8’s sheetrock to get the correct fire rating and sound rating. What else did you do for the ceiling assembly? Hi Matt. I don’t think there is any code that calls for more than one layer of 5/8 sheetrock for fire rating. I also don’t think there’s any code for sound insulation and there is no “correct” rating. It’s completely up to you how much you protect for sound. I understand it’s difficult to know how much to do for sound and there are many factors involved. Resilient channels work great for vibration (footsteps, etc), IF they are installed correctly. Read up on that. Sound batting is another fairly efficient way to take care of other sound like voices. The second layer of sheetrock may or may not be worth the cost to do it. But if you do it, you should look into that insulating gel that goes between sheets. Other things to do are lay down carpet or rugs with thick pads upstairs. You can also try to take care of squeaky floorboards in main walkways before you finish the ceiling of the basement. Lina here. I’m the coordinator for the ADU Case Studies Project. I’m going to send a note to John to see if he’s able to address your question. Please stay tuned! I’m so curious about the key card on the heaters, can you post a picture with the setup or post a link to what you used? Thanks! edit: Here’s another one with more of an explanation. https://images.tradeservice.com/9ETBOIYK8205G6UU/ATTACHMENTS/DIR100129/LEVMFCE20252_N42.pdf . 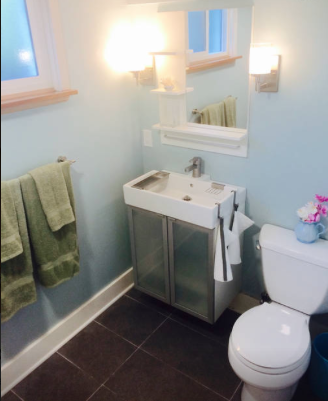 This entry was posted on May 22, 2015 by linamenard in 600-799 SF, Basement, Case Study, Conversion, Projects and tagged affordable ADU, basement, basement ADU, basement apartment, basement conversion, basement dwelling, basement remodel, basement renovation, basement rental, John Hayden, key card heater, short-term rental, Stephani Hayden.